His Highness Saif bin Zayed announces the arrest of a female suspect in Monday’s gruesome slaying of an American schoolteacher working in the UAE. Authorities say they’ve also linked the suspect to a bomb plot targeting an Egyptian-American doctor and his family. Source: Abu Dhabi police. BULLETIN: (Updated 10:41 a.m. ET U.S.A.) Police and security forces in the United Arab Emirates have arrested a suspect in the fatal knife attack Monday against a Hungarian-American schoolteacher and say the suspect also planted a bomb outside the residence of an Egyptian-American doctor. The bomb allegedly targeted the male doctor, his wife and three children. It allegedly was planted after the suspect murdered Ibolya Ryan, 47, a kindergarten teacher formerly of Colorado. Ryan was the mother of three, including twins. She was attacked in a Reem Island mall restroom. 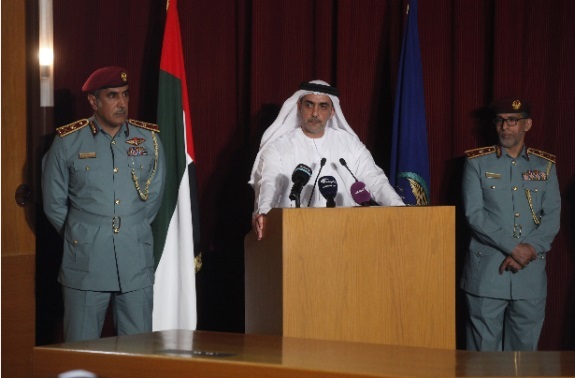 His Highness Sheikh Saif bin Zayed, Minister of the Interior and Deputy Prime Minister, announced the arrest. The suspect has been identified only as a woman who confessed after a raid by security forces. The UAE now is on “the highest levels of alert,” with the incidents described as terrorism, according to a statement released through Abu Dhabi police. Although it remains unclear whether Jihadists engineered the attacks on Ryan and the unidentified doctor, the UAE itself appears to be ramping up security.